A hugely effective mystery/horror/thriller from Spain, El Orfanato is the latest film from Iberia to take the art houses by storm, off the back of the likes of Pan’s Labyrinth and The Devil’s Backbone. The film, which is directed by Juan Antonio Bayona and stars Belén Rueda, Fernando Cayo and Roger Príncep, tells the story of a woman named Laura, who brings her family back to her childhood home, where she opens an orphanage for handicapped children. Once there, Laura discovers that the new environment awakens her young son’s imagination – but before long, the fantasy games he plays with an invisible friend turn into something much more frightening. Desperate to save her family from the increasingly disturbing occurrences in the house, Laura turns to a group of parapsychologists for help in unraveling the mystery that has taken over the orphanage – but finds something more terrifying than she could have imagined. 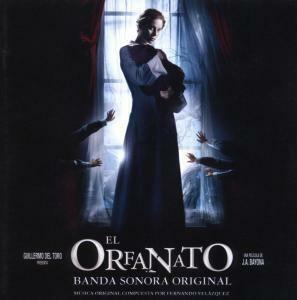 The music for El Orfanato is by Spanish composer Fernando Velázquez, who has enjoyed a successful career in his homeland, but is likely to be completely unknown to the vast majority of international audiences. Velázquez’s music is elegant, thematic, beautiful, but also unnerving in the way all good mysteries should be. The opening “Prólogo” features a gorgeous child-like melody for flutes over strings which recalls Jerry Goldsmith’s work on Poltergeist; and, like Goldsmith, later incarnations of the melody are twisted and deformed into nightmarish variations on itself. Nervous harps and skittery strings raise the tension levels in the misleadingly playful “El Juego del Tesoro”. The menacing, yet still classically beautiful “Un Día de Fiesta” makes a more blatant foreshadowing of the dangers to come. The heavy string dissonances in “Atropello”, “Tomás” leave the listener in no doubt as to the nature of the music; when the enormous choir comes in towards the end of “Una Regresión”, the effect is stunning. In fact, El Orfanato is a score without low points… “Sola en la Casa” is a wonderfully propulsive action cue which underpins the swirling string writing with a relentless ostinato to drive it forward. The finale of “La Casita de Tomás” drips with a delicious, pseudo-religious sense of wondrous revelation, while the conclusion to the score – “Reunión y Final” and “Créditos Finales” are beautiful, thematic delights. This is a hugely impressive international debut by a clearly very talented composer; let’s hope that this is just the first of many scores from Fernando Velázquez were hear over the next few years. Highly, highly recommended.